Warner Electric leads the world in the design and development of electromagnetic clutch / brakes, having pioneered the technology over 70 years ago and maintaining market supremacy ever since. The range includes IEC-fitment in-line units that extend the capability of geared units, shaft-mounted units, motor brakes and even custom-designed units that can be mounted according to individual machine requirements. Warner’s range also includes the full spectre of control equipment. 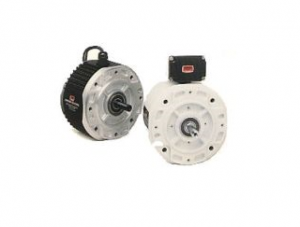 Electro Modules are individual clutch or brake units which are assembled together to comprise a clutch. brake or clutch/brake combination. Electro Modules can be bolted directly to a NEMA or IEC motor or reducer or they can be base mounted for stand alone operation. Electro Modules offer the ultimate in clutch/brake convenience. They are easy to install and require no lubrication or maintenance for life. First determine whether the Electro Module must perform the basic function of start or stop or a combined start-stop. A wide range of module combinations for use with motors, reducers and other standard power transmission components is available. The flexibility of Electro Module enables you to pick the exact combination of function and design. Electro Modules for power on application are purchased as individual clutches and brakes to be assembled for C-face, flange mount or foot-mounted applications. Fail safe operation is the primary feature of power off Electro Module brakes. They can be used as brakes, motor brakes and in combination with clutches. Warner Electric controls assure that maximum performance from the Electro Module system is derived. Contact us or follow this link to download the catalogue.